Hana is a small town, located at the eastern end of the island of Maui and is one of the most isolated ones with a population of only 1,300 inhabitants. Although Hana is only 52 miles (84 km) away from Kahului, Maui’s airport, it is a about two and a half hours drive to get there, without taking any stops as the road is very winding and narrow. The Road to Hana passes over 56 one lane bridges, 46 of which are only one lane wide. There are approximately 617 curves and if you want to enjoy this beautiful road, it will take you about five hours one way which means seven to nine hours round trip from Kahului depending on stops. In order to enjoy this memorable day without driving a winding road, you’d rather contact DanielsHawaii. DanielsHawaii offers tours in luxury vans and they will guide you to all the scenic stops. Though pricier than driving yourself, but taking a tour allows you to focus on the incredible scenery while someone else focuses on navigating the winding curves. DanielsHawaii takes the first stop at the historic Paia town, which is about ten miles away from Kahului. There, you can enjoy a great breakfast, buy some snacks, sandwiches and enough water for your trip. However, if you still plan to do this tour on your own, make sure you have enough gasoline, because Paia is the last town before you make your journey to Hana Town. 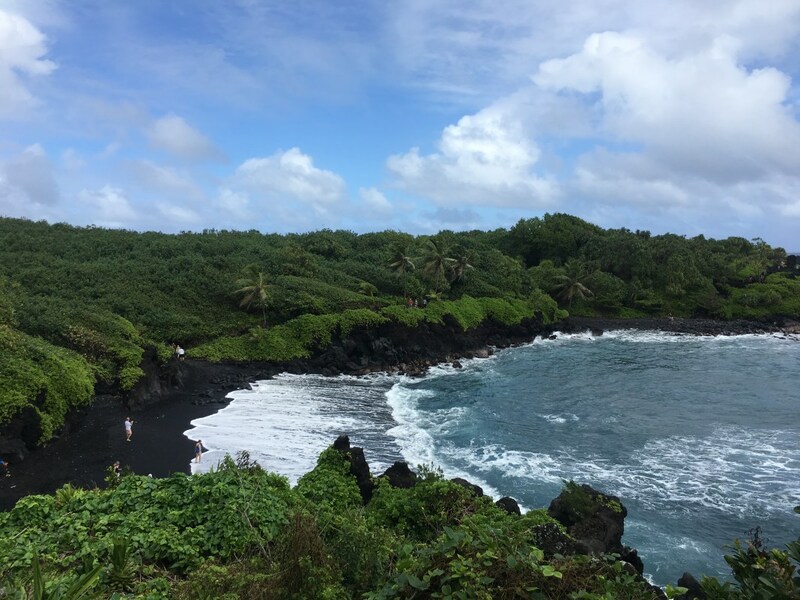 From Paia to Hana you drive a scenic winding 42 mile road that leads you through a lush rainforest with cascading waterfalls and breathtaking ocean views. Along the way you can also see lava tubes and take stops at great lookouts. The Road to Hana Tour is definitely an adventure with many unforgettable memories and photos in a beautiful paradise. The hike to see Twin Falls is unique and beautiful. These picturesque waterfalls offer a large area to swim at. Trio of large waterfalls amid rocks & lush vegetation with a popular swimming hole. Here you can hike to a waterfall with freshwater pool, as well as bathrooms and a picnic area. A great place to for a quick swim. This is a fun spot to pick up some gifts and have a great meal. Hana Lava Tube is around the 31 mile marker, you’ll need to turn left on ‘Ula’ino Road and drive for less than 1/2 a mile. This remote little general store is the only stop on road to Hana for refreshments. An isolated place known for that nothing has changed much in centuries. The Wailua Falls are tall and beautiful and literally on the road and along a bridge. After a long day of winding roads, waterfalls, hiking and beaches, Enjoy a cocktail and a great meal while relaxing by the pond or inside their restaurant. The Maui Tropical Plantation is the perfect place to take a rest before heading back. Want to stay up to date about Hawaii? Check out DanielsHawaii YouTube Channel!